Recipe submitted by Holly Clegg, author of Too Hot in the Kitchen: Secrets To Sizzle At Any Age. Grab a large skillet for a quick journey to the Mediterranean. Take advantage of the scrumptious sauce. Serve with pasta or rice (try whole grain pasta or brown rice). In large nonstick skillet over medium heat, heat olive oil and sauté onion until tender. Stir in tomatoes, parsley, garlic, oregano and season to taste. Bring to boil, reduce heat, cover and cook 15 minutes, stirring occasionally. 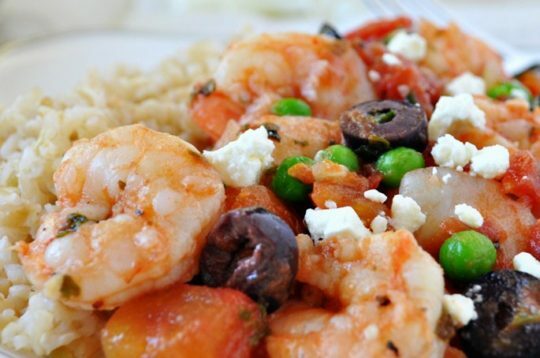 Add shrimp and olives; continue cooking until shrimp are done, about 5-7 minutes. Add peas, cook several minutes. Sprinkle with feta, serve. Each recipe makes 6-8 servings.